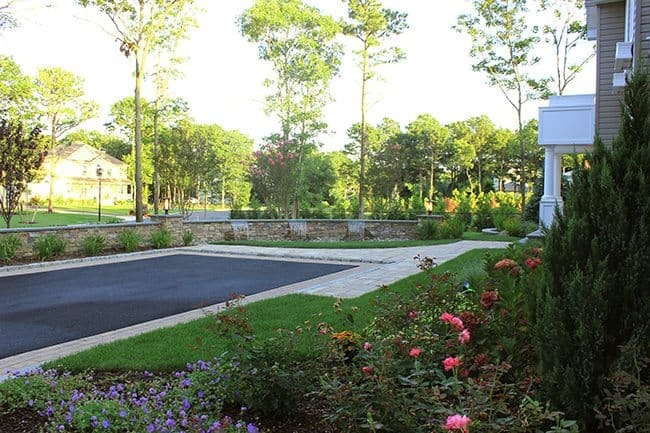 As this was a new home built in a newer development where the overall majority of the properties were of a simpler landscape design, we were very excited to have the opportunity to create something for our clients that was unique and would stand out from the rest. 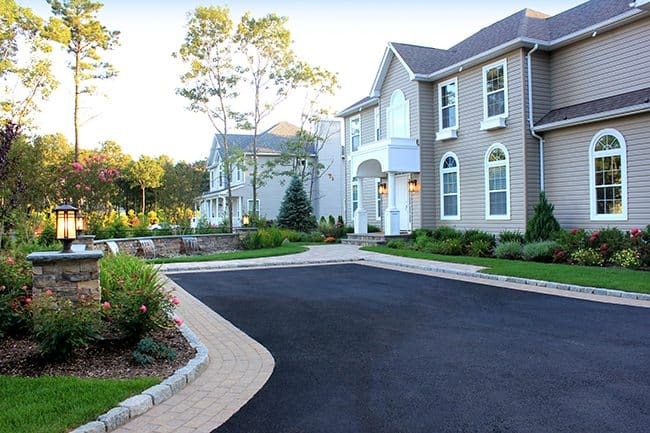 Initially, these homeowners requested a circular driveway for their front entrance. Due to onsite dimensions and budget restrictions we introduced a parking court concept allowing for greater maneuverability and a more memorable experience when approaching the front door. 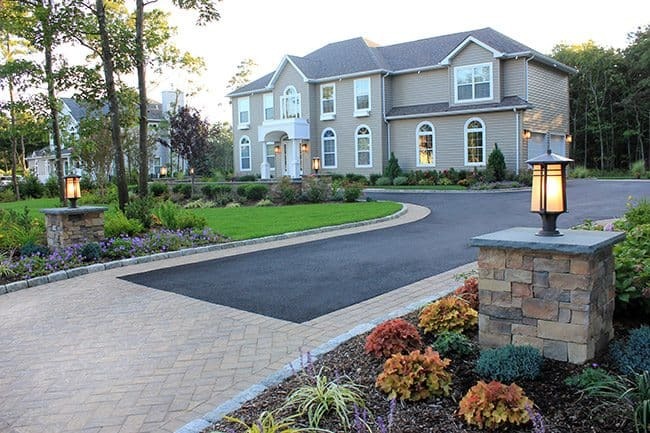 The entrance to the driveway is flanked by two light pillars veneered in cultured stone highlighting the large herringbone paver street apron. We used a running bond pattern on the bordering inlays to suggest how visitors should enter and traverse the extensive driveway. The radial running bond pattern forced us to cut every paver, keeping all joints tight and consistent. 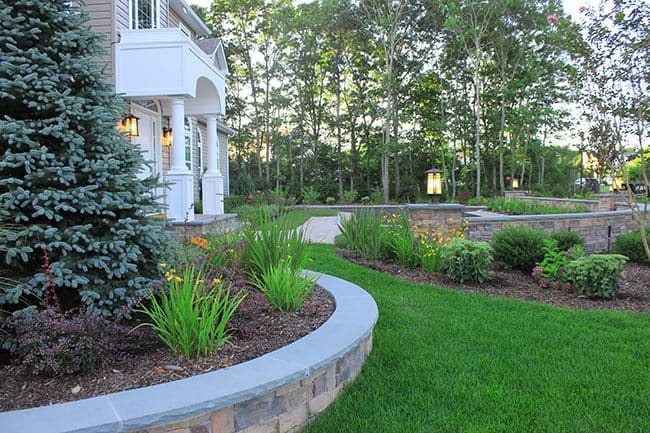 This orientation offers visual cues for one to be led naturally to the home’s entrance and up to the front door. As you enter the parking court the double-sided stone wall softens the appearance of the parked cars by recessing them visually into the landscape as the walls project up 2 feet from the site line from the street. The wall was set on a 3 foot depth frost footing reinforced with rebar and built out of concrete block, then veneered with Cambridge Ledge Stone. Two inch thick Bluestone treads were hand templated out of larger slabs to mimic the curvature of the stone wall. Three 36” tall consecutive light piers were built into the wall leading one to the front door. 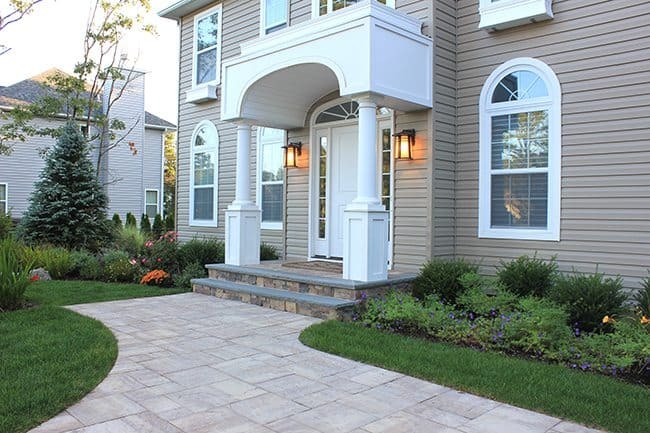 Our concept was to use the front entrance as a usable secondary space between the street and the house to enjoy. You realize you’ve reached your destination when you are greeted by the three sheer descent pondless waterfalls with color changing LED lighting. These water features disappear into a trough and get recycled through a mere 10 inch wide stone wall. We felt it was important to incorporate a lawn area within the courtyard to expand and soften the feel of the space. Initially the homeowner questioned whether the waterfalls should be facing the street so they could be viewed as one drives by rather than facing the interior of the home. The intimate “nook” we created convinced them they could enjoy the waterfalls from their front stoop on a daily basis, making this a very unique and functional space for the entire family. A radial retaining wall was constructed which sweeps out from the corner of the home to counteract a grade change on the property. The wall continues the flow of the stone work throughout the property while supporting a robust Blue Spruce. This beautiful specimen tree distracts the eye from the neighbor’s home while walking up the driveway and up-lighting draws one’s attention inward. The lighting scheme was developed to reinforce the directional design that we created. 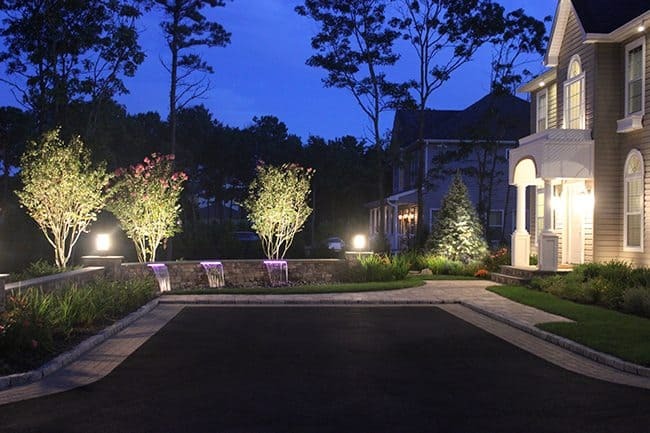 We highlighted all flowering trees with a high temperature bulb to reduce glare closer to the home which acts like a privacy screen from the surrounding streetlights and neighboring properties. A mixture of perennials, flowering shrubs and evergreens soften the intricate stone work and provide visual interest throughout all seasons. 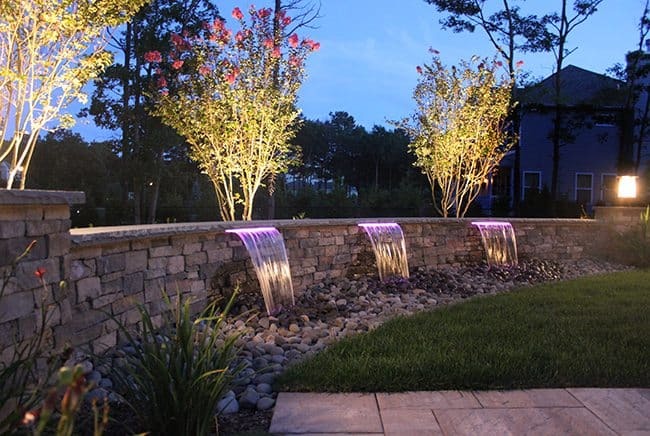 Three Crape Myrtle ‘Muskogee’ trees were chosen to frame the three sheer descent waterfalls while a combination of up-lighting and LED lighting shimmer off their leaves each evening. 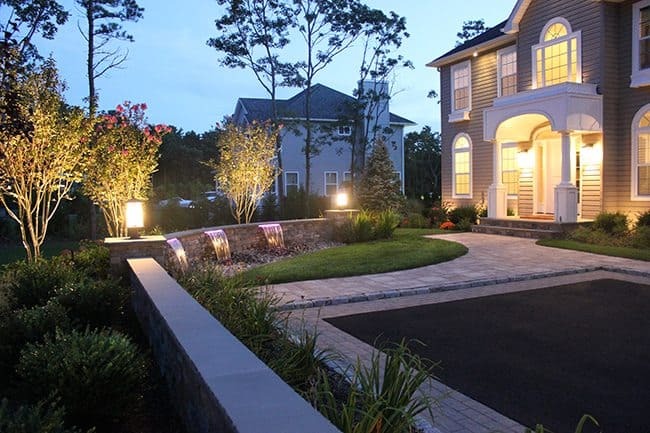 This unique design is now changing the way other homeowners are visualizing their properties throughout the neighborhood while providing a stunning and interactive front entrance for this lucky family.